I've talked a lot about using sign language with your baby or toddler. Now here's my chance to shut up and let you win some free resources to help you introduce baby sign language into your own family. Look What Mom Found...and Dad too is teaming up with Baby Signs With Elizabeth to offer to one lucky reader either the Baby Signs® Complete Starter Kit , which contains everything parents and their babies need for a successful start to signing, OR the Baby Signs Potty Training Kit , which contains a program and supplies for combining potty learning with baby sign language. 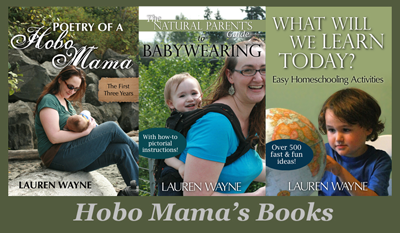 You can jump through various hoops on the Look What Mom Found blog to get entries, and the contest ends July 17. 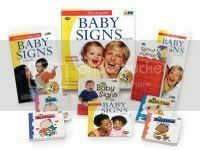 Baby Signs® is a brand of baby sign language headed by Linda Acredolo and Susan Goodwyn. (Some baby sign language classes you see offered will be a specific brand, and some will be generalized.) Baby Signs is a good program, based on what I've read of the book. 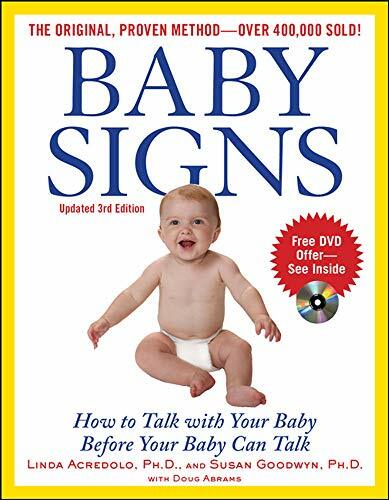 When I was investigating baby sign language, Linda Acredolo's Baby Signs book was one that I sought out from the library, and it was very helpful in getting me started. I haven't personally used the Complete Starter Kit , but it all looks great. It includes an illustrated step-by-step signing guide for parents and caregivers, and instructional DVD introduction to the Baby Signs® Program, video dictionary of 100 most useful signs, a signing DVD for babies, Signs at a Glance Flipper flip-card with magnetic backing for easy display, and a set of board books for little hands with colorful illustrations to introduce and reinforce some common signs. I put a lot of the items in the starter kit on my baby registry, but my gift givers bought me not a one. I can't complain, because, hey, gifts are gifts, but I mention just to say that I did think they'd be useful resources to have around the house, and I thought the book was a helpful starter guide. I can't vouch for the Baby Signs Potty Training Kit , because all I've seen has been the online commercial for it. We've been doing elimination communication with our son, which has included sign language along the journey, so I've never felt the need for a specific kit like this and can't give you any impression of whether it works and how respectful it is to kids. I'm not big on rewards-based pottying myself, and it looks to come with stickers and such. I'm not saying you shouldn't win it, just that I'm not promising whether or not it fits with your particular philosophy of potty learning. If you don't win and you're feeling stuck, check if your local library has the signing starter kit or at least the book available. It should almost certainly have something that covers baby signing, enough to get you started. For instance, any of the Signing Time DVDs are fun for adults to start learning a few useful signs. Also check out my links to internet resources in this post, because you might find what you need there. Have fun, and happy signing!